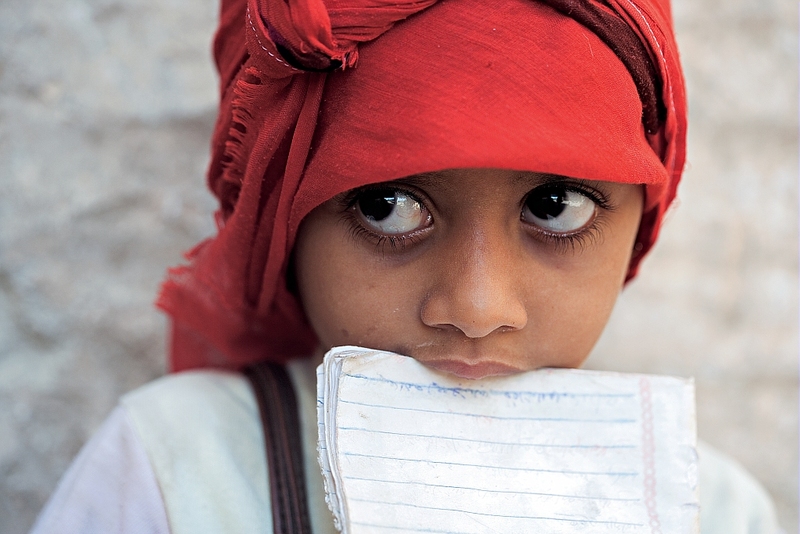 The schoolgirl Bayan, Zabid, Yemen. I met Bayan as she was walking to school in Zabid before Yemen fell into the hands of Islamic radicals. Has Bayan had to give up her education? How to make the world a better place? to more needy countries around the world. “Solidarity” with a big S changed into solidarity with the victims of extreme poverty, wars and natural disasters, into a solidarity of hearts and deeds. The image of the global world is depressing. Chronic poverty, which means the possibility of less than one meal a day, affects 1.2 billion people, and 660 million lack normal daily access to clean water. Nearly 66 million refugeess have lost their homelands and live in humiliating conditions, with no hope of change. The world is currently afflicted by 64 wars, which are killing tens of thousands of people a year. Meanwhile, the rich countries of the North live in fear of terrorism and the influx of refugees. Today, many young people wonder and are asking ever louder the question: how to save humanity? How do we change that which is the source of so much suffering and injustice in a world divided into two by wealth? What’s needed today is a new, more committed and universal solidarity, one aimed at creating conditions for the sustainable development of all societies. The suffering of our brothers and sisters is multiplied by our indifference to their problems, and our perception of poverty as a threat to our own rich world. To change this, we need dialogue. According to that great philosopher Father Józef Tischner, “dialogue means people coming out of their hiding places, approaching each other and beginning to exchange views. Even the beginning of dialogue – coming out of hiding – is a big event. You have to step forward, cross the threshold, reach out and find a common place in which to talk”. Precisely such an ideal place is the “Me and You” exhibition, whose message is the chance for its viewers to build consensus and understanding, friendship and mutual respect for people of other races, cultures and religions. It is an opportunity to jointly undertake active and everyday solidarity, placing in our hands responsibility for the shape of the world in which we want to live. My name is Janina Ochojska, I head the Polish Humanitarian Action. Despite my disability, I initiated the founding of an organization that has helped millions of people in 44 countries. I hope that the message of the “Me and You” exhibition inspires you to undertake some concrete form of assistance for the victims of the wars in Syria and Iraq. Below you will find information on how you can go about it. May this turn out to be a lasting gesture, full of commitment, responsibility and hope for our consciences. – the Polish Humanitarian Action, which she heads to this day. of humanity, impartiality, independence and neutrality. Our work is to provide the most basic needs: access to water, food, safe shelter and education. We are currently working in Somalia, South Sudan, Syria, Iraq and Ukraine. Syria has suffered armed conflict since 2011. Fighting has forced more than 10.5 million people to abandon their homes, and of these some 6.3 million have taken shelter in the country. The civilian population is constantly threatened by air raids and attacks, and the situation is deteriorating year by year. There is no permanent access to food or water. 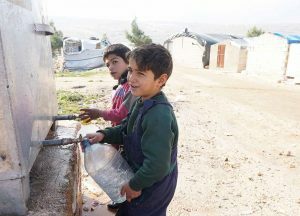 This war of several years has left the people of Syria living in very difficult conditions. and the most necessary hygiene products. We provide access to food: by distributing food packages, and working with local bakeries, providing them with flour and yeast to produce bread at fixed low prices. In December 2016, news of the evacuation of the population from eastern Aleppo echoed around the world. We organized immediate aid for those who reached the camps. We built latrines, hand washing points and new water pumping stations. New arrivals received food and personal hygiene packages. the very unstable situation in the country following the fall of the regime. to the most basic needs of the city’s residents. 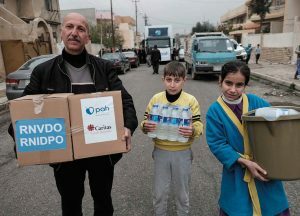 We are gradually extending this action to the Kurdistan region, where we will also distribute care packages to the most needy. You too can support the people of Syria and Iraq!